You will find the largest selection of all types of wreaths, greens, roping, garland and boughs in the area right here at Jim Jenkins Lawn & Garden Center. We have varieties you probably have never seen before as we receive stock from across the country. We receive fresh shipments from the week before Thanksgiving through the week before Christmas to assure you the top quality that you deserve. We will gladly create any combination, shape, color scheme and size especially for you. Come visit our Wreath World Room in the Greenhouse and explore all of the possibilities. We also carry all of the wreath making supplies you may need including a huge selection of ribbon. Check our FaceBook page for daily photos of our creations ! Soak Greens- Immerse in cold water overnight or up to 24 hours. The needles will soak up moisture. Good locations for this job are a laundry or bath tub. Dry- Allow greens to drip dry for an hour or so in a shady well ventilated area. Spray- WITH Wilt Stop until dripping wet. This seals the moisture into the needles, extending the life of your greens. Do not spray Princess Pine roping or Juniper Berries. Keep cool- Keep greens in as cool a location as possible, out of direct sunlight and away from heat. Remember that a wreath hung on a door in between a glass storm door will bake in the sunlight and not last as long. Hang the wreath on the outside of the storm door for a longer life. 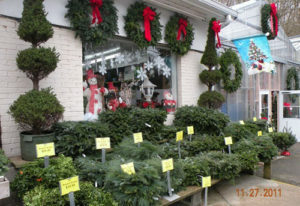 Fresh greens and wreaths look and smell great inside of your home ! Add bows and pinecones for simple and traditional decorating. Have a vision of your perfect decorating item ? Bring it to us and we will create it for you or supply you with the materials and instructions to create it yourself !